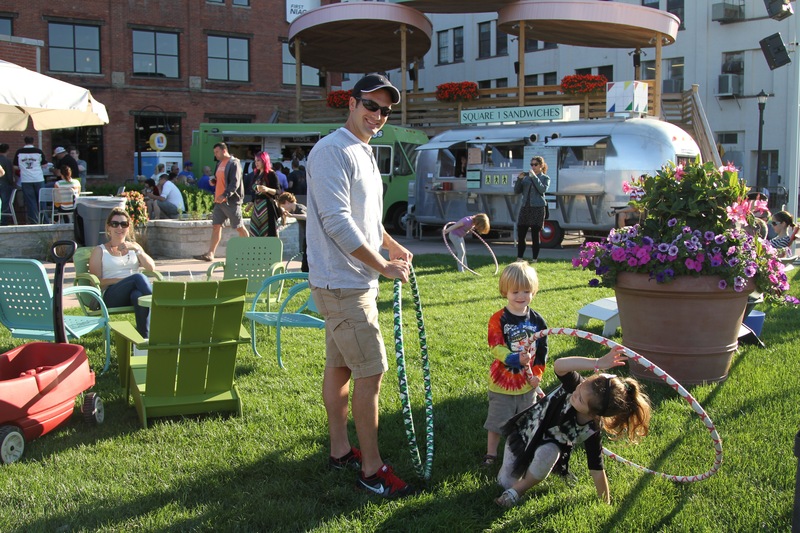 The value of vibrant public spaces and walkable communities isn’t lost on corporate America. Companies throughout the country are making decisions and investments to positively impact the communities and neighborhoods where they reside. By revitalizing real estate, establishing amenities, creating public parks and gathering spaces, and initiating programming and events, companies and their partners are creating valuable assets that support attraction and retention, and foster goodwill in the community. These efforts are unfolding in cities large and small, with public and private partners, and private developers, creating lively gathering spots. The initiatives are important to economic development because not only do they support businesses, offer amenities, and increase property values, but also because they create attractive places for people to work, live, play and visit. Vibrant public spaces allow citizens to spontaneously interact and engage with each other, and according to research, walkable communities contribute to a healthy citizenry. Additionally, millennials want to live in walkable communities, according to a report released in June by George Washington University, which found 558 walkable urban places or WalkUPS, in the country’s 30 largest metro areas. The study found the desires of millennials will drive the development of tens of millions of square feet of walkable space, and hundreds of new WalkUPS. The report ranked 15 of today’s top walkable cities and the future top 15 walkable cities. Today’s top five are Washington, D.C., New York City, Boston, San Francisco and Chicago. “Companies that are engaged in their downtowns as DTE is in Detroit and many others can really influence the way our employees, our customers and business partners view us and how they interact with the city,” says Randi Berris, spokeswoman, DTE Energy Co., which provides more than half of Michigan’s residents with either natural gas or electricity. The company’s initiative, known as Energize Detroit, is focused on the western end of downtown, where the company’s headquarters is located, and which is a 10 to 15 minute walk from the heart of downtown Detroit and the Campus Martius development. Campus Martius is area which was been transformed into a vibrant public space, home to headquarter operations for CompuwareCorp. and Quicken Loans Inc.
DTE Energy’s officials want to encourage their employees to stay in the area after work. “Once senior leadership made the decision to make an impact on the neighborhood in which we reside, we started buying properties as they became available,” Berris says. One of the first purchases was a triangular lot, where two industrial buildings have been razed. In the near term, DTE Energy will create a green space, which is located catty-corner to its headquarters. Initial discussions for the future of the space include a public space for entertainment, food trucks and/or art installations. DTE Energy is also involved with an initiative in Detroit called Live Downtown, which provides incentives for people to rent or buy in the city. “These are great ways for businesses to help repopulate the city with professionals who help increase the tax base and provide critical mass,” Berris says. “Vibrant public spaces are valuable assets for companies because employees see it as an amenity, a place to hold business meetings, and a place to hang out with friends after work,” says Meg Walker, director of design and vice president, Project for Public Spaces (PPS), a nonprofit that helps communities and organizations create people-friendly public spaces that build strong communities. PPS has discovered through the years the more different events and programs are in place, the more popular a public space is. One of the organization’s projects was Bryant Park in New York City, which was mostly occupied by drug users and homeless citizens in the late 1970s and early 1980s. Implementing a master plan to create a destination for everybody, today Bryant Park is one of the most popular public spaces in the country. Activity at Larkin Square, a public gathering space in Buffalo, N.Y. Image courtesy of Larkin Square. Farther north in Upstate New York, a private developer had a vision to create a public space in Buffalo that would be an amenity for workers, as well as a destination spot for visitors. 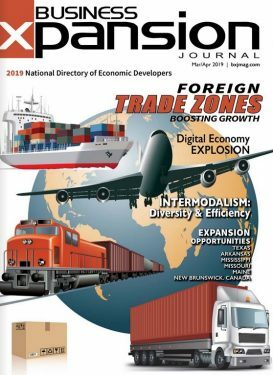 In 2002, Howard Zemsky, managing partner, Larkin Development Group, purchased the 600,000-square-foot Larkin Terminal Warehouse at the former Larkin Soap Co. site, which still had a few existing facilities in place. The development, Larkin Square, is located a mile east of downtown Buffalo. Today, Larkin Square employs more people than when it was the Larkin Soap Co. The square is home to the headquarters for First Niagara Bank, a back office for a large health care system, the Western New York headquarters for Homeland Security, and law offices. “First Niagara helped pay for the Larkin Square build out because they understood with their headquarters here, they had a great retention tool,” says Leslie Zemsky, director of fun at Larkin Square. The development is a family affair, where Howard and Leslie Zemsky and their son, Harry, are involved with Larkin Square. “What no one expected was the amazing organic growth as we started events and programs,” Leslie Zemsky says. Last year, the square ran a 13-week series in the summer on Wednesday nights to cater to people who work at the site, with events running from 5 p.m. to 8 p.m. “The actual result is that 90 percent of the people who come to our events come from around the community; some drive an hour,” Zemsky says. Family fun at Food Truck Tuesday at Larkin Square. Image courtesy of Larkin Square. The redevelopment of the Larkin site has spurred additional developments in the area. A brewery is set to open two blocks from the square, complete with tours and tastings. What’s more, a distillery will open down the street from the square. Walker says in 2013, Campus Martius began implementing lighter, quicker and cheaper ideas to attract even more people downtown. 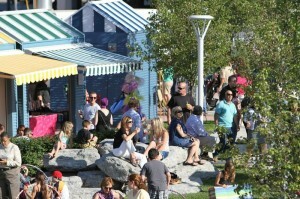 A beach was created at the campus, complete with a deck, lounge chairs, and a bar and grill. “We received $75,000 in assistance from Southwest Airlines; they are working with us to do placemaking in the cities where they have major hubs,” Walker says. 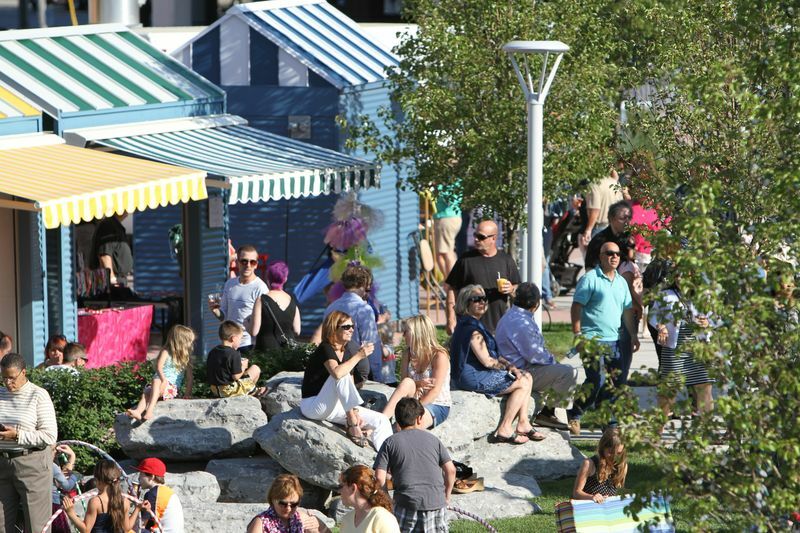 Other efforts have included an increased amount of programming such as concerts and family events, opening beach volleyball and basketball courts; and opening a prepared food market, and a flea market in Cadillac Square, located next to the campus. “All of these things don’t cost too much to set up, they go in fast, attract a different audience, and get people to stay longer,” Walker notes. In the Energize Detroit initiative area of downtown, DTE Energy is underway with renovations to its headquarters facility, updating the workspaces floor by floor. The company has created an inviting entryway, complete with a water feature. DTE Energy has also purchased a building located across the street from its front entrance. The facility temporarily serves as the location for the company’s IT department until the workplace transformations are completed at the headquarters operation, scheduled for 2018. The building, formerly home to the Salvation Army, has been renamed the Navitas House, which means “energy house.” In regard to the long-term uses of the building, early ideas include turning over the building to a developer to possibly include commercial developments on the first floor, and possibly office spaces, and incubation space for entrepreneurs. When downtown areas undergo revitalization, and when programs are activated in these spaces, these public places become hubs of activity. These efforts materialize when corporations and public sector partners, and/or private developers hold visions to create amenities to serve the people located in the spaces. These developments not only attract companies and talent, but also tourists and visitors as well. Vibrant public places are catalysts for economic development, producing walkable communities, which can lead to healthier workers — people who rarely ventured out of their workplaces due to lack of services, events, programming and gathering spaces to meet for lunch, for example.